Requirements: Provide distribution mechanism to allow well-known television series to run innovative social media campaign around upcoming publication. The hit TV series “How I Met Your Mother” published a tie-in title for fans of the show. The Bro Code, written by lead character Barney Stinson, is a popular plot reference for social behavior among “bros”. In an effort to increase awareness and sales around both the book and TV show, publisher Simon & Schuster turned to BookShout. 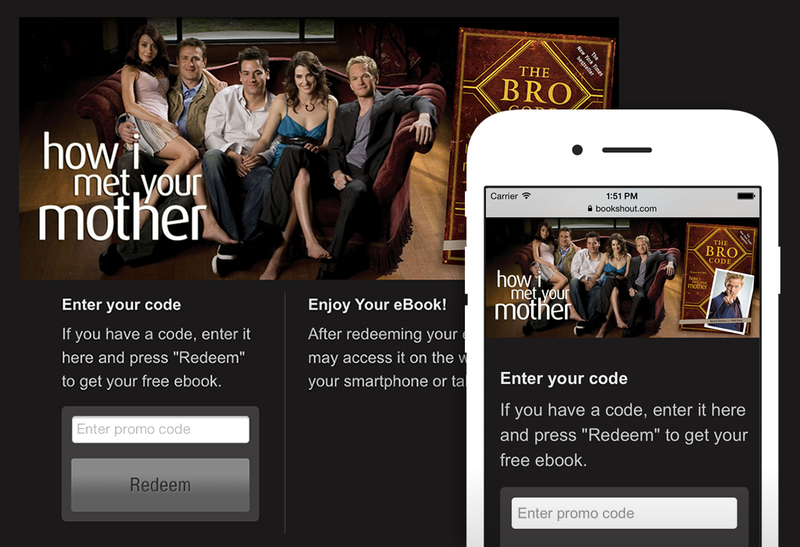 Participants were able to redeem eBook codes for The Bro Code and download the digital content in a simple, step-by-step process. Whether on-the-go or following along with the show, fans could read from their device of choice or via the web. BookShout’s tools brought over 10x the number of active participants than originally estimated. Social campaigns allow easy engagement; they gather valuable data and create more sales opportunities.